I've been taking a metalworking sculpture class over the past few weeks with Ecco Pierce at Artisan's Asylum these last few Sunday evenings. Although I had some prior experience with (MIG) welding in the metal intensives class I took last year, I wanted to get back into the welding bay area to get better at it. We recapped a lot on the various tools of the shop, including the bandsaw, chopsaw, sandblaster, grinders, and grind wheels. We also covered MIG, Oxy, and the Plasma rig. 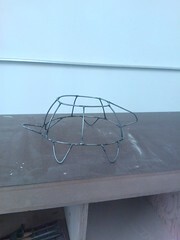 I started this "portly" metal turtle sculpture in the last couple classes, after some initial sketches of things I thought might work in wire steel. First things first. 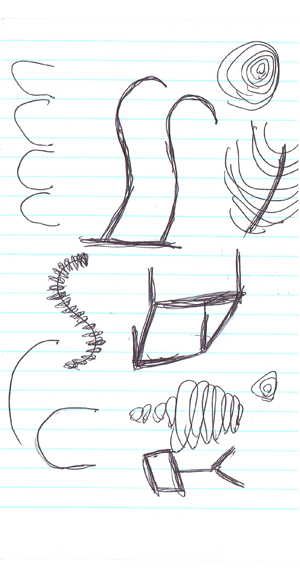 I drew up some sketches of how I might construct the turtle in metal. 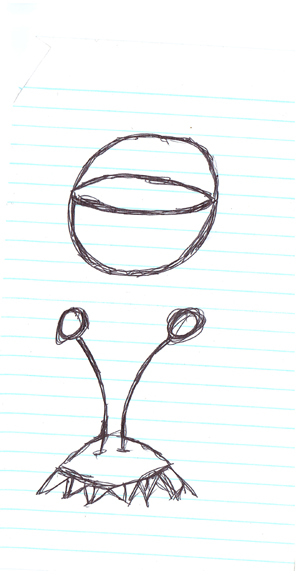 For material, I was thinking that because of the circular nature of the turtle, some round bar might be appropriate. 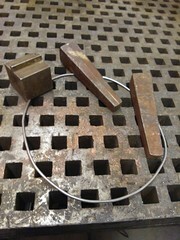 I started by bending some smallish, 8mm round bar into circular structures. One for the top, and one for the base. I used a large vise to help bend the round bar to form the exoskeleton. When all was said and done, I had a couple of round pieces of turtle base. I then chopped up several pieces of the "rib cage" for the turtle. 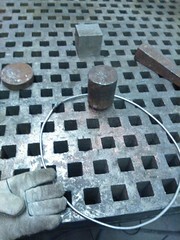 Then I welded one first piece from the top to the bottom circular pieces. I had originally thought about doing a "jig" out of foam, like a half shell to make it easier to weld, but I ended up using magnets and using one hand to hand to hold the piece study, and another to do the actual weld. 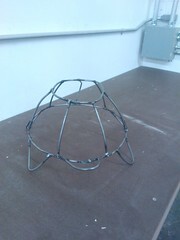 I welded the bottom first, then the top. I held off on making welds all around the 1st rib, until I had all the others in place. 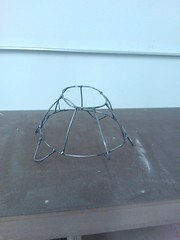 I continued in a circular pattern around the base of the turtle, building up the rib cage. I moved onto creating the "legs" of the turtle. This was just bending some of the 8mm round bar into flipper like feet. I also constructed a tail by bending some round bar, as well as a head. After getting all the pieces welded together, I went around the whole piece again, and made sure that the metal turtle survived a drop test. Here are some final photos of the skeleton of the turtle. 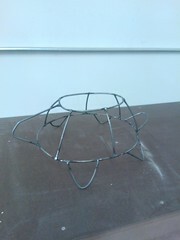 Right now the turtle is functional as a wire sculpture, but I will be adding more detail to it. I think I may use some rebar tie, and weave the individual shells pieces. It's going to be tedious, but I'm going to experiment with that. I had also thought about doing thin, flat sheet for the turtle shell pieces, but that may be above my skill level at this particular point in time. We'll have to see how that goes. - Magnets are a big help to hold things in place. I originally tried tape and failed. 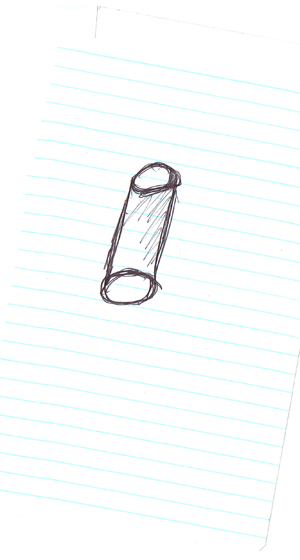 - Making things completely circular is challenging in steel round bar. I used a vise, but it was still challenging getting it all the way circular without a proper bending tool. BTW. 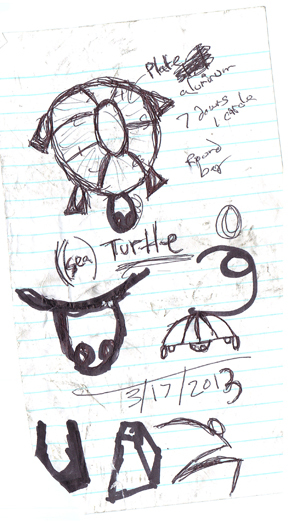 Here are some the earlier concepts I had in the metal class before doing the turtle. I thought about doing a cobra, but it seemed a bit daunting for a 1st project. I was messing around with what I could do with cylindrical objects in wire. 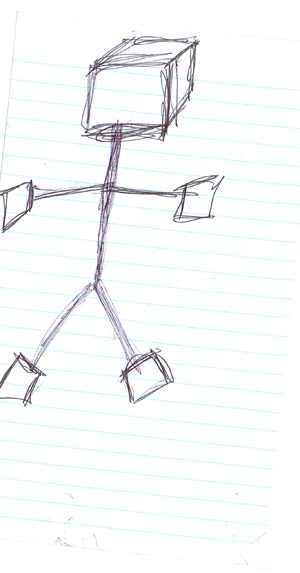 I was going to do a simple wire "box man", but it seemed over done, so I passed on the idea. I played a lot with shapes to see what would be easiest to do in round bar and some other stock. A sea creature and the start to an eye ball.